Algoriddim‘s djay lineup has been a mainstay in the DJ app market, getting its start on the Mac over ten years ago, becoming one of the early iPad hits, and over the years expanding to also include iPhone, Apple Watch, Windows, and Android. Throughout that time, djay has proven extremely popular with professional, amateur, and aspiring DJs alike for its powerful yet intuitive tools that make it easy to replace physical media and turntables with a single computer or mobile device, making djay the world’s best-selling DJ app with over 30 million downloads while also winning a pair of Apple Design Awards. 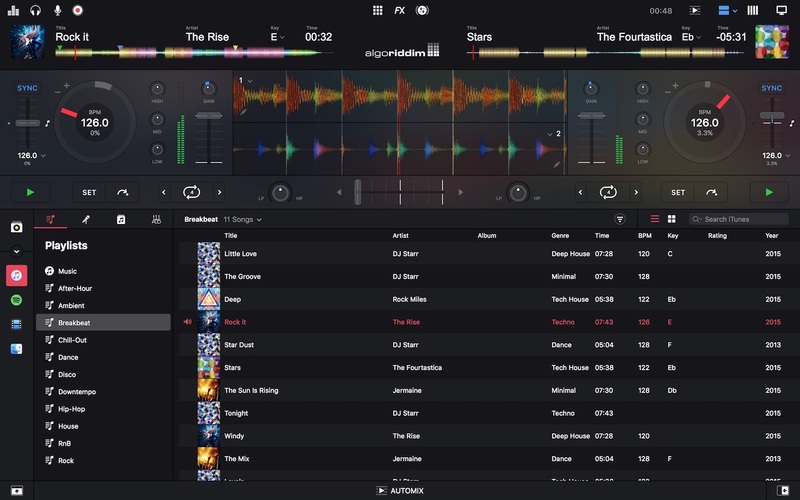 Three years ago, the Mac version of djay became djay Pro, gaining a revamped interface, integration with Spotify, and a host of other new features, and Algoriddim has continued to make improvements in the app since that time, most notably with an on-stage demo at Apple’s October 2016 media event where Algoriddim showed off Touch Bar support for djay Pro on the redesigned MacBook Pro. Today, Algoriddim is launching djay Pro 2 for Mac, a major update bringing quite a few features that not only improve the user experience today but also set the stage for more advancements down the road. We met up with Algoriddim’s Michael Simmons and Christoph Teschner last week for an in-person demo and overview of the new features, and we came away impressed with the update. The biggest feature Algoriddim has brought to djay Pro 2 for Mac is Automix AI, a massive improvement to the app’s existing tools for creating automatic, beat-matched mixes of your songs. Machine learning and artificial intelligence are obviously hot topics these days, and Algoriddim is leveraging those technologies to make transitions between songs even more seamless. With Automix AI, djay Pro 2 automatically scans the current and upcoming song, identifying the best sections of the two songs to facilitate fading between the outro of one and the intro of the next. Automix AI automatically optimizes EQs and filters for each transition, and the Morph functionality keeps beats and tempos match throughout the transition. Pairing Morph with the Match song recommendation engine from Spotify gives users a seamlessly mixed automatic playlist that helps them discover new music, but also lets users take over manual control at any time. 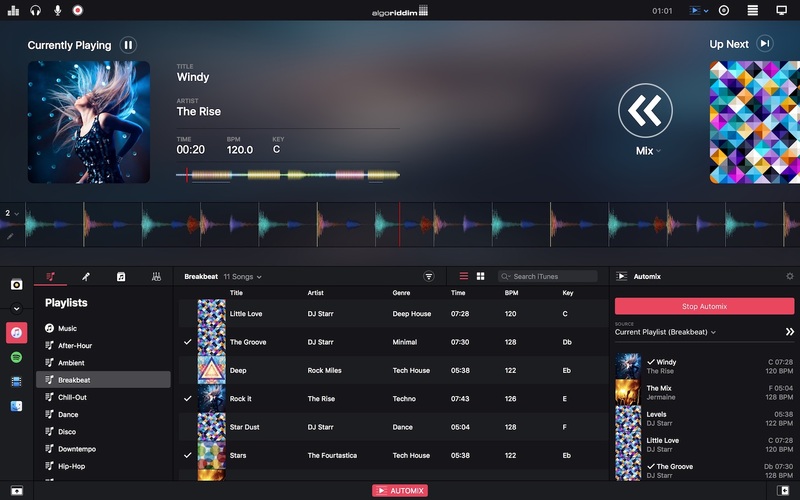 Algoriddim sees itself on the forefront of bringing AI technology to music, said Simmons, wondering out loud why Apple Music, Spotify, and other music services haven’t jumped on the opportunity to use AI to recommend songs and create mixes for their own users. Teschner pointed to workout playlists as a prime opportunity for this sort of feature, where AI could build a seamless mix of songs to eliminate dead time between tracks and awkward transitions, keeping your energy and momentum going. It’s clear Apple has some interest in this area, given the company’s long partnership and just-announced acquisition of Shazam. The music recognition abilities of Shazam can certainly serve as the basis for such a feature, automatically scanning and identifying songs to help match tracks that complement each other and flow well together, something Algoriddim has already spent years refining. Perhaps my favorite feature for the casual user is the new PhotoBeat functionality that makes it simple to create a photo slideshow set to music. Integrating directly with your Photos library and building on a similar video feature from the original djay Pro, PhotoBeat in djay Pro 2 lets you pick albums, moments, or even hand-selected photos, and set them to music. Photo transitions happen in time with the beat of the song, and you can customize the transitions on-the-fly from a quarter of a beat per photo all the way up to four beats per photo. With multiple decks, you can queue up different photo sets and songs and smoothly transition between them with various visual effects. Everything is done live, allowing you to apply audio filters and other settings with the photos following along to stay in sync. Text and image overlays can also be applied to the photos, and it’s easy to project the resulting output via HDMI or AirPlay. If you’re using your own music or purchased tracks, you can also export your slideshows for sharing. Another area of significant enhancement is in the media library, with the introduction of local playlists on a dedicated tab in the library to help manage content from different sources. Using Split View, you can easily drag and drop tracks from Spotify, iTunes, and your computer’s file system into a single playlist. The overall djay Pro interface has also been refreshed, with live HD waveforms that make it easy to drill down visually into the audio content, as well as a reduction in popover controls that previously hid other interface elements while active. The refreshed interface will still be immediately familiar to those who’ve used djay Pro, but everything is just better organized and easier to get to in djay Pro 2. A powerful keyboard shortcuts editor lets you assign any function within the app to a custom keyboard shortcut, while full accessibility support with VoiceOver enables vision impaired users to hear descriptions of everything that’s happening in the app, separate from the music mix. Overall, djay Pro 2 remains a feature-packed DJ app for the Mac, and Algoriddim continues to raise the bar by both adding new capabilities and making existing ones easier to use. There’s still a bit of learning curve, but once you start to figure things out it becomes pretty intuitive. The feature set also scales with your experience, letting beginning DJs get familiar with the basics before moving on to more sophisticated skills. djay Pro 2 for Mac launches today at an introductory price of $39.99, with the price rising to $49.99 following the introductory period. A 15-day free trial is also available. To celebrate the launch of djay Pro 2 for Mac, Algoriddim is also running a half-price sale on its iOS apps, with the iPad app on sale for $9.99 [App Store] and the iPhone app priced at $4.99 [App Store]. djay Pro 2 and sale prices may still be rolling out at the time of publication. Original article title: Hands-On With djay Pro 2 for Mac’s New AI-Driven DJ Mixing and Beat-Matched Photo Slideshows. 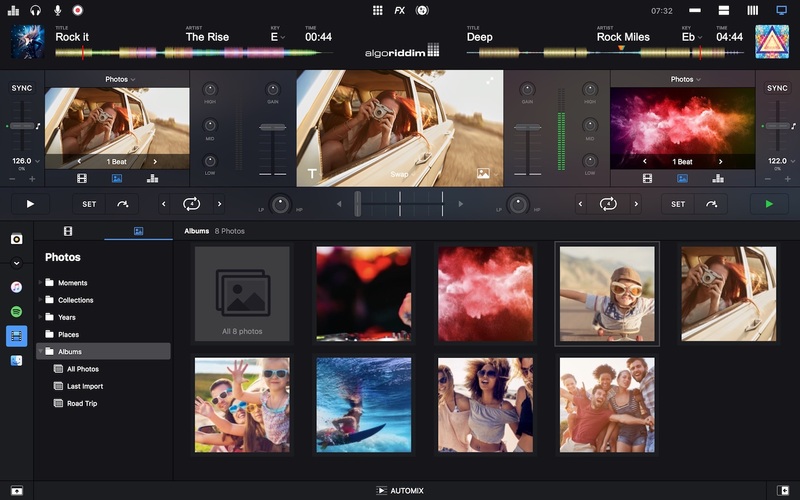 This full article can be read at: Hands-On With djay Pro 2 for Mac’s New AI-Driven DJ Mixing and Beat-Matched Photo Slideshows.